A lovely collection you won't want to miss. Loved this wonderful book from Ann Edall-Robson. Edall-Robson has created a lovely collection of poems, prose and photos. Besides being an author, Edall-Robson is also a gifted photographer. When a book can be enjoyed over and over again - and rewarded each time! Easy to fit into the stories. Thanks! Got it, read it immediately and loved it. Last night was cold and rainy here in Lethbridge, so I snuggled in with your book (Moon Rising). Wow - awesome! I so enjoyed it! Your stories and poems are wonderful - evoked so many memories of my childhood. I thoroughly enjoy your stories & poems. Your writings pull at the heartstrings. Photography is lovely. This book is a "trip down memory lane"....back to a time when life was a little slower proving that we never know what we had was so good. This is a great little book. Moon Rising brought back many fond memories. Ann Edall-Robson has invited us to share a bit about her world in Moon Rising . . . A series of intimate vignettes; her thoughtful arrangement of words and images encourages us to fondly consider certain perspectives that may seem quite routine to some. She reminds us to tap into our own memories and leads us back to that safe, comfortable place as we reminisce about the ‘usual’. But everything is celebrated by Ann! Her descriptive observations become the magic that transforms these normal occurrences into something ‘special’. And we are that much richer for recognizing the wondrous world that Ann has returned us to . . . a reward for taking the time to immerse ourselves in life’s bounties! Moon Rising has a way of transporting the reader to a place where memories live, and where the past isn’t so distant. The poetry and prose are skillfully paired by the Author herself. It is a wonderful collection. 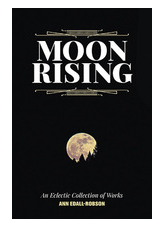 In Moon Rising, Ann Edall-Robson skillfully shares her poetry, prose and photographs. This collection of work enables the reader to experience the richness of rural life. Her work covers a wide range of emotions. The nostalgia had me longing for a life I’d never known. Writing from different points of view gave me unexpected insight. The vivid imagery used pulled me into her stories as if I were experiencing them alongside of her. This is a book that you will enjoy reading and re-reading.